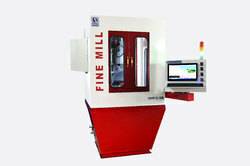 Leading Manufacturer of cnc trainer milling machine from Pune. We are a trustworthy organization in the market, actively engrossed in offering CNC Trainer Milling Machine. Rugged Machine with Ground Bed. Latest Technological Platform for Software. Interactive CNC Part Programming Software. STK Import / Export Facility. MPG (Manual Pulse Generator) . Looking for Trainer Milling Machine ?